Is Callie coming back to Grey’s Anatomy? Executive producer Debbie Allen recently spoke with TVLine about the possible return of Sara Ramirez to the ABC TV show. 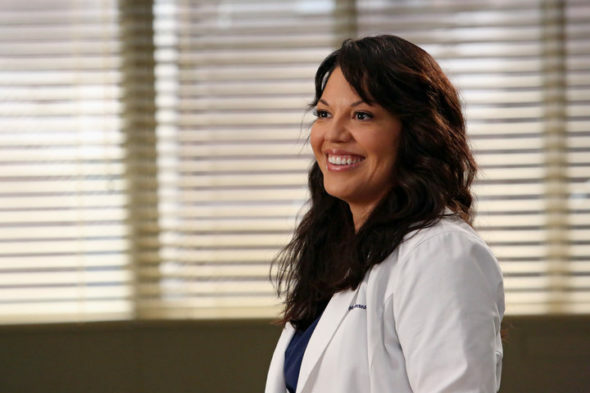 Ramirez played Callie Torres on the long-running medical drama from season two to season 12. The show’s current cast includes Ellen Pompeo, Justin Chambers, Chandra Wilson, James Pickens Jr., Kevin McKidd, Jessica Capshaw, Jesse Williams, Sarah Drew, Caterina Scorsone, Camilla Luddington, and Jerrika Hinton. Season 14 of Grey’s Anatomy debuts on ABC on September 28th at 8 p.m. ET/PT. What do you think? Do you watch Grey’s Anatomy? Do you want Ramirez to return? Looking forward to more Grey’s Anatomy! Welcome back! It is time to put this series to bed. It used to be great and now it is just dragging on. Callie was my favorite character – she brought light, humor, as well as strength and common sense to the show. I would absolutely LOVE to have Ramirez come back !! !